Fuzz’s favorite muffins are filled with cream cheese. I like them too, but wanted to liven things up a little and decided to incorporate some blueberries. After a couple of experiments, Todd and I (Fuzz was left out of the tasting because she doesn’t like fruit in muffins) concluded that these were much better than the original. For the blueberries, I used frozen. And rather than stir them into the batter, I just pressed them into the batter after adding the cheesecake filling. As for the topping, I thought I’d messed it up since it kind of melted into the muffin and didn’t hold its shape, but what happened was it hardened into a flaky shell which we loved. So all in all, these were a huge success and I’m looking forward to making them for friends. Of course we have to eat these first. They freeze well, so I’m keeping them in individual freezer bags and thawing them out the night before. Moist muffin filled with cream cheese and topped with a crunchy streusel. Preheat the oven to 375°F. Grease 12 muffin cups or line with paper liners. In a small mixing bowl, mix together the cream cheese, sugar and lemon juice; set aside. Stir the flour, baking powder and salt together in a medium size bowl and set aside. In a mixing bowl, beat the butter and sugar until light and creamy. Beat eggs, one by one, until batter is light and fluffy. Stir in the vanilla and lemon zest. Add the flour mixture alternately with the milk and stir by hand until mixed. Do not over-beat. 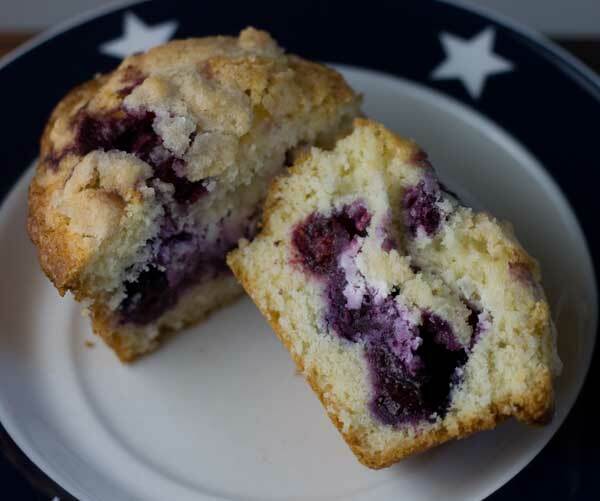 Put a generously heaping tablespoon of batter in each muffin cup. Press a few frozen berries in the batter, then put a spoonful of cream cheese filling over the batter, using all the cream cheese filling and dividing evenly. Press another couple of berries into the cheese. Top with remaining muffin batter, dividing evenly among the cups. In the same bowl you used for the muffin batter (or flour mixture), mix 2 tablespoons flour, 5 tablespoons sugar and 1/2 teaspoon cinnamon. Add 2 chopped up butter and mix with a fork until crumbly. Sprinkle over tops of muffins. Bake the muffins for 28 to 30 minutes or until set and golden brown all over top. Let cool for 10 minutes in the pan, then carefully remove from pan and let cool completely. Make sure to let the muffins cool before you attempt to remove them from the pan. They're kind of delicate while warm, and need that extra 10 minutes or so to set. Stop thinking about making these and just do it. They are fabulous. My husband and my mother both just looked at me and said OMG. Neither one of them hold back an opinion, good or bad. I can’t wait to make these for my grandchildren. They are also great to make ahead, they just get better. I would say they hold well for 4 days. That is if everyone does not devour them first. I made the recipe as written and used it for 12 regular size muffins. It was perfect. Don’t cut back, even if you think it is too much. Just fill ’em up and they will not disappoint. These were *sooooo* good! I loved the filling, and I’m going to make the muffins again with more blueberries because I think I skimped the first time around. Thanks for a fantastic recipe! This were so darn good! thanks for the recipe! Pineapple is a great idea!! You can use any fruit or just leave the fruit out altogether. I know blueberries are a key ingredient in these, and they do look tasty, but would a chopped apple or some pineapple tidbits work as well? I am not a huge fan of blueberries. These sound yummy! I love blueberries and lemon together and the extra tang and texture from the cream cheese seems like it would put them over the top. Mmm, those sound good and I have sitting in my fridge 4 bricks of cream cheese that I need to find things to use it with. I hate to say it, but I thought the lemon zest and the lemon juice really *made* the muffin. Sorry ;). They would be good without the lemon, but I just loved the lemon, blueberry & cream cheese flavor.